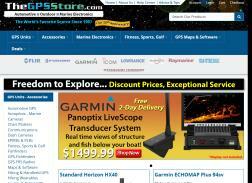 Offers Garmin, Magellan, Lowrance, Tomtom, and Delorme GPS products. Worldwide shipping. Save $20 on orders over $300. Save $15.00 with online orders of $300.00 or more. Coupon is not valid with any other coupons or offers. Thanksgiving Weekend Super Sale! Get $100 off Garmin RV 760LMT GPS for RV’s. Get $150 Via Mail-In Rebate when you purchase Raymarine DragonFly 7PRO. Offer valid in the USA and Canada only. Limit one rebate per qualifying product purchased. Limit one claim per person or per household. Get free UPS ground shipping on orders over $50. free ground shipping on orders over $99. Save $15.00 with online orders of $300.00 or more. Good thru 2/29/2012. Not valid with any other coupons or offers. Save up to $40 via mail-in rebate on purchase of Standard Horizon Products. Only one product per rebate form. Must be postmarked by 1/15/2016. Rebate form offer valid only in the USA and Canada. See site for more details. Expires on 12/31/2015. Get free UPS ground shipping on orders over $99. Save $15 with online orders of $300 or more. Certain exclusions may apply. Offer cannot be combined with any other coupons or offers. Expires on 06/30/2014. $15.00 Discount on orders of $300.00 or more. Valid thru 11/30/2011. Offer Cannot be combined with any other coupons or offers. Get $40 off after mail in rebate when you buy Standard Horizon HX870 handheld VHF with GPS. Only one product per rebate form. Postmark by 01/15/2017. Get $200 prepaid card via mail in rebate when you buy Lowrance SonarHub or SpotlightScan Transducer. Limit three rebate claims per household. Include a dated copy of your register receipt. Not valid for retailers or wholesalers. Conditions & limitations apply. See merchant site for details. Need to mail the form by 01/21/2016. Ends on 12/31/2015. Get $8 flat rate shipping on your purchase. Get ACR 2844 GlobalFix Pro EPIRB for $324.95 after mail in rebate + Free 6 Month 406Link Plus Subscription from ACR. Promotional offer only valid in the 48 continental U.S. states, Hawaii, Alaska, Puerto Rico and U.S. Virgin Islands and Canada. Your rebate form must be post-marked no later than 30 days from the purchase date. Get $150 off after mail in rebate when you buy Raymarine DragonFly 7PRO GPS Fishfinder. Valid in the USA and Canada only. Thanksgiving Weekend Super Sale! Get $200 off Garmin Oregon 650T Handheld GPS with US Topo Maps.